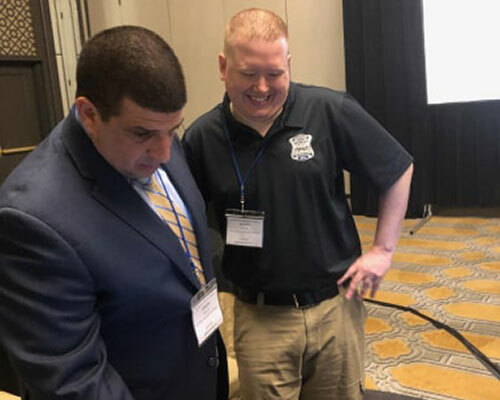 Haverhill and the Merrimack Valley were well represented late last month at the School Safety Advocacy Council’s national conference on bullying with School Committeeman Scott W. Wood Jr. joining Methuen Police Lt. Joseph Aiello to offer a presentation on the role of social media in cyberbullying. Wood tells WHAV he joined Aiello and Police Chief Joseph E. Solomon at the Jacksonville, Fla. event to understand how other states across the country protect student from tech-based bullies. According to Wood, the Methuen Police pair are among the nation’s leading experts in law enforcement responses to bullying. Some of the newer apps circulate material that cannot be screenshot or stored on a server, Wood explains. Indeed, Wood speaks from experience. The Haverhill native has spent the last six years as a patrolman in another community. On the heels of Haverhill’s decision to post a resource officer at Nettle Middle School, Wood hopes the action will shift a preconceived notion that all officers do is make arrests at schools. The decision to add to Nettle’s staff was made given the fact that Haverhill Police respond to that school more than any other in the city, Wood said. Action items from the conference Wood plans to implement in Haverhill include a push for professional development on the latest cyberbullying apps, as well as a possible presentation from “The Wire” actor-turned anti-bullying advocate Tray Chaney.